Rosha Yaghmai, Imitation Crab, 2017, silicone, cotton, pigment, tin weave, bricks, 84 1/2 x 47 1/2 x 4". This calls for rose-tinted glasses. Rosha Yaghmai’s enchanting exhibition consists of a collection of objects that radiate mauve, periwinkle, and lilac. The assembled furniture—benches, curtains, lamp-like structures—appear still, a carefully arranged tableau. The artist envisions the gallery space as a threshold, a site of transition from interior to exterior, oscillating between public and private. On each wall, heavy silicone curtains affixed to brick resemble doors, portals into—or, perhaps, escape routes out of—her oneiric world. Infused with pigment and bits of fabric that range from tulle to quilting cotton, her flat entryways also act as paintings displaying bright, geometric, minimalist patterns. 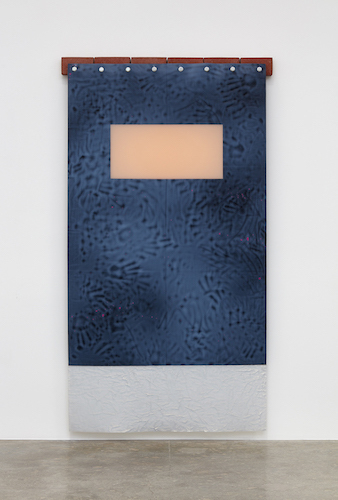 In Imitation Crab (all works 2017), blue swirling motifs recall handprints, feeling around the material in an enigmatic trail. Dangling from steel hooks, these silicone sheets seem to pendulate between the space of the courtyard and what may lie just beyond its enclosure. In her series “Pipe,” thick panes of hardened resin appear to drip from upright rusted plumbing formations. Each resin sheet traps bubbles, imperfections, and, most notably, varying shapes and hues of photochromic-sunglass lenses. The floating purple circles and gray ovals evoke organic forms like sea mollusks or petrified bugs enclosed in amber. These lenses assume an abstract but also ethereal quality. The summarily titled Courtyard, Fiberglass Bench whispers in the same octave, radiating a purple-hued variant of Klein Blue. Viewers are invited to sit here and peer through her opaque figures and distorted windows. Yaghmai’s courtyard becomes a site for reflection, refracting light as it fosters introspection.